Gramin Bank of Aryavart Final Result 2015 Declared Appointment Letter Joining Formalities - Gramin Bank of Aryavart (GBA) has declared interview result / final result on 14.09.2015 (Monday) for the posts of Officer Scale 1 & Office Assistants (Multipurpose). The interview result of additionally selected candidates had conducted successfully due to shortfall of vacancies for these posts. The selected candidates will send intimation regarding appointment / joining formalities very soon on the official website. 53 candidates has finally selected for Officer Scale 1 post and 70 candidates has got recruitment on Office Assistant (Multipurpose) posts. The final result has published in PDF format. The recruitment project of bank was 2014. Gramin Bank of Aryavart (GBA) has released Final Result / list of Finally Selected candidates for 493 posts of Officers Scale I & II (General Banking Officers, IT & Marketing Officers) and Office Assistants (Multipurpose). GBA has released result of interview which was conducted from 24th February 2015 to 14th March 2015 for the posts of Assistants, from 10th March 2015 to 18th March 2015 for the posts of Officer Scale I and on 19th March 2015 for the posts of OFFICER SCALE-II (GBO, I.T. OFFICER & Mktg. OFFICER). The interview was conducted along with document verification of the candidates on the same day as per notification and list of required documents released by GBA. The Final Allotment of Station / Appointment Letter/ Joining Date will be given in the month of April 2015 to these selected candidates. Candidates must remind that the selected candidates will be intimated individually (by email/ post) regarding completing the pre recruitment formalities, very shortly. The date of reporting with instructions regarding completing the formalities will be informed through email/post. So candidates are advised to check their email ID and official website of GBA regularly for latest updates and information. Earlier GBA has released cut off marks result category wise required to qualify for interview which was scheduled on various dates in the month of February / March 2015. Those candidates who had appeared in interview for these posts and waiting for their interview result; they can download their Final Result/ Interview Result from the direct link provided in the end of the posts. The Gramin Bank of Aryavart has released Final result based on the cut off marks required to qualify to attend personal interview of the candidates and interview marks which was conducted with document verification of candidates. A list of short listed candidates has been released based on score obtained in RRB CWE III more than cut off marks are called for personal interview on the official website of Aryavart Gramin Bank. Three times more than required candidates were called for personal interview. The interview will be scheduled on the various dates in the month of February / March 2015. Based on their Total Weighted Standard Scores (TWSS) the interview call letters were sent to these shortlisted candidates by post/ courier. The total marks for Interview was 30 marks. The qualifying marks i.e. bench marks in Interview was 40% i.e. 12 out of 30. The interview was conducted at Gramin Bank of Aryavart Staff Training Centre, B-4/42, Vipul Khand, Near City Montessori School, GOMTI NAGAR, LUCKNOW- 226 010 for all the posts. The interview was conducted along with document verification of the individual candidate to check / match the originality of the candidate. A Final Merit List / Final Result of selected candidates has released on the official website of Aryavart Gramin Bank. 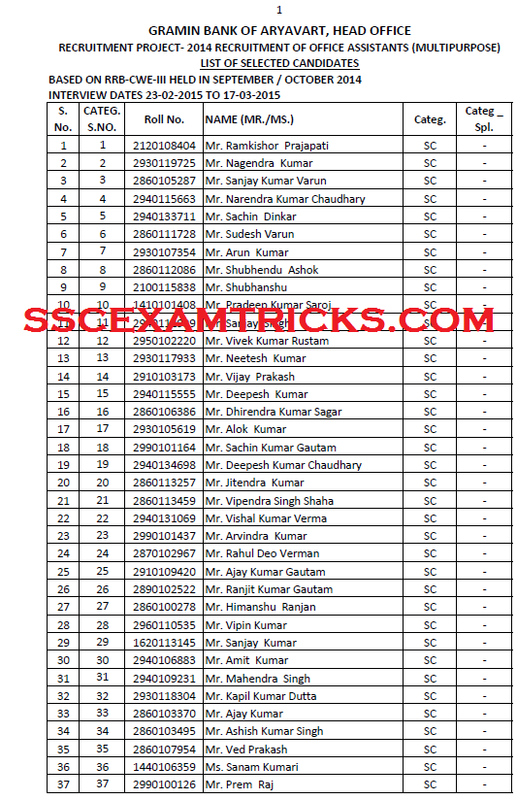 The list of Wait Listed candidates of Office Assistant (Multipurpose) cadre is also available. The wait listed candidates will only get a chance if selected candidates of the category fail to report for joining in our Bank. The Final Allotment will be provided in the month of April 2015. The date, time & venue of reporting have sent to these finally selected candidates on their Email ID mentioned/ registered with GBA.